Here comes another paneer recipe from me. The recipe was sleeping in the draft section for a long time. Finally, it has come out today to be published for the blogging marathon event. Thanks to the event. As TH and I like capsicum a lot, I added them with this dish. You can add any vegetables available at hand or simply go only with paneer. Everything goes out well with this dish. 1) Heat oil in a pan and add cumin seeds and sliced green chillies. Allow it to crackle. 2) Add onion and saute well till it turns translucent. 3) Add tomato saute till it get completely mashes. 4) Add red chilli powder, coriander powder and salt. Mix well. 5) Add capsicums and peas. Stir fry for 5 minutes. 6) Add crumbled paneer and continue frying for another 2-3 minutes. Initially paneer forms a sticky texture but after few minutes, it will again get the crumble texture. 7) Garnish with coriander leaves and serve hot with roti/rice. We enjoyed it as stuffing for tortilla. 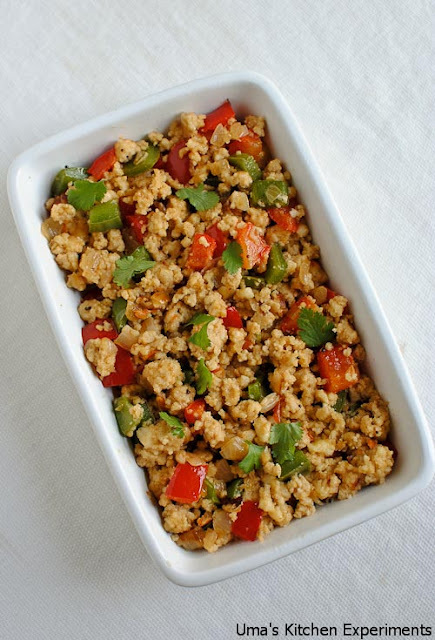 1) If you are making paneer at home, use the excess, shapeless corners while cutting into cubes for preparing this bhurji. 2) Store bought paneer also gives a best result for this dish. 3) Add any vegetables as per your choice. Check out what others are cooking for Blogging Marathon by clicking it here. Nice clicks Uma .. happy weekend :). Very tempting n tasty one..have tried it,delicious! !Nice clicks too..
Paneer an all time favorite at home...and this recipe comes to rescue most of the times. Love it. 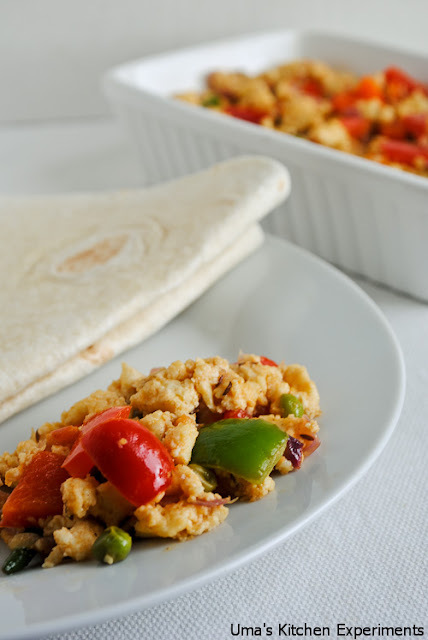 The ever popular & fav, tasty burji!! The ever popular & tasty burji!! A great paneer recipe, would go good in pita bread. 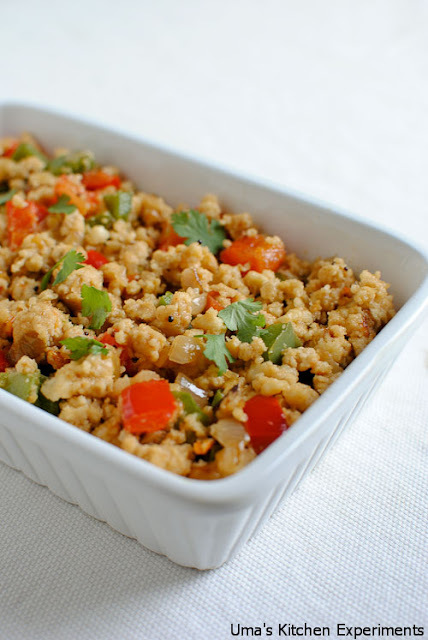 Mouthwatering here, wat a terrific and super tempting paneer bhurji. Very yummy n simple recipe love it any time...very niceclicks Uma!! Waiting for your last 7th recipe with paneer :) wats it ?? 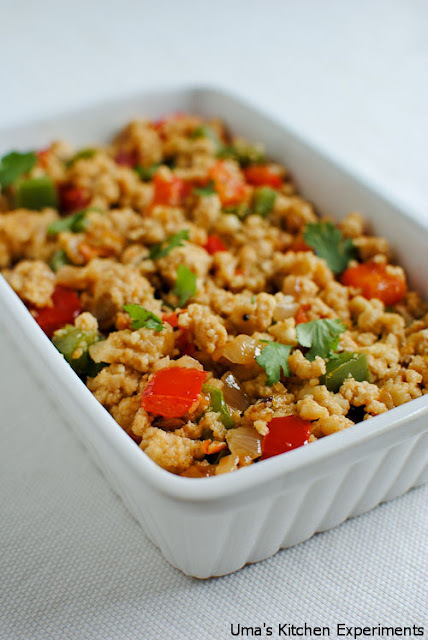 Delicious and colorful looking paneer bhurji. Wonderfully prepared. nice burji. i love them.